SUP and Pedernal, Abiquiu Lake. "It’s my private mountain. It belongs to me. God told me if I painted it enough, I could have it." After she passed away in 1986, O'Keeffe's ashes were scattered at the top, making sure it was indeed hers. Abiquiu Lake is one of New Mexico's larger lakes and offers a wide variety of opportunities for recreation. There is camping (both tent and RV) available right on the lake, and plenty of room for anglers, powered watercraft and paddle craft to all share. As with most places in New Mexico, Abiquiu lake does get windy in the afternoon, so plan accordingly. when the winds do pick up, you can still paddle around the leeward side of the many small islands and coves on the north-east side of the lake. We brought the pup with us for this trip. 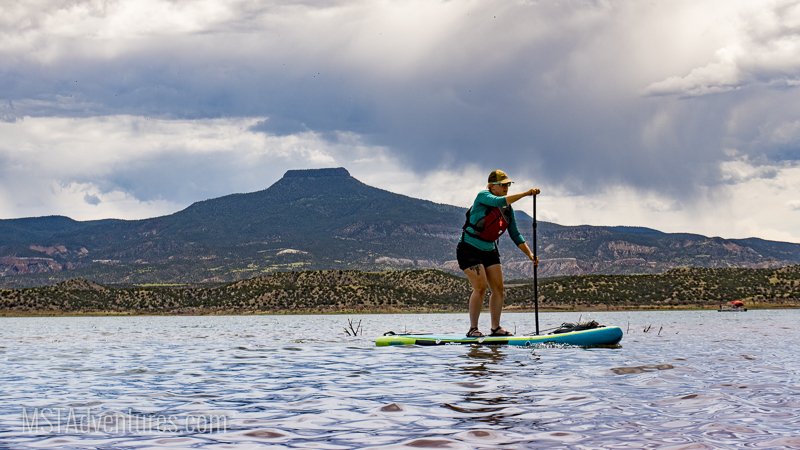 She's still getting used to SUPing (having been to Cochiti Lake with us only a handful of times in the past), but she is certainly getting better each time we go out. Treats make a wonderful motivation for a lab/beagle mix! Of course, her good-dog-instincts kick in as I paddled out for a photo op and she came swimming after to "rescue" me (doesn't she look so proud at the end?). I did finally get that photo op, though! Of course, all good things must come to an end, and we got out of there just before the rain you see in the background really let us have it. Storms may put a bit of a damper on your immediate fun, but they usually produce some great sunsets! 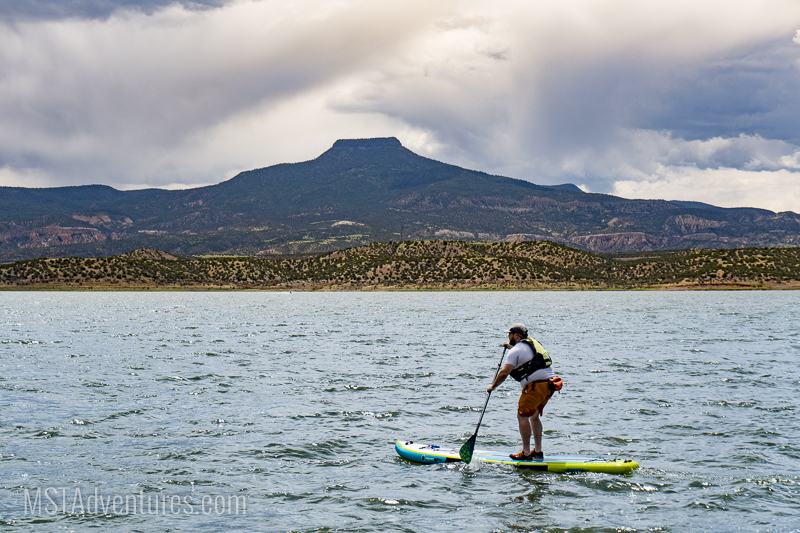 Overall I'd rate Abiquiu Lake as one of the top SUP destinations in New Mexico. Not only is the lake itself great for exploring, but the Chama River feeds directly into it - allowing for up to Class III whitewater runs for the daring! If you want to take a break from the water, Ghost Ranch is less than 10 minutes up the road where you can hike, get art tours and take trips by horseback to explore Georgia O'Keeffe's favorite place on earth. Want to go but don't have the stuff? Give us a call - SUP and Camping packages are available for rent.